We noticed recently that many players were reporting long load times (over 30 seconds! ), which is not ideal. I’ve written about the save system before, and until now it’s served pretty well. We decided to investigate and came away with some neat optimizations, and some insights into the meta-game. After running some tests on culprit save files, we found that there were way more lockering events happening than anything else. Players seem to love going into a dungeon and converting their locker item, they also love coming out and reclaiming it, but will often just go find that item again and re-locker it over the reclaim slot. It didn’t make sense to keep two matching ‘destroy’ and ‘restore’/’relocker’ events, so we wrote a save game pre-processor that can go through the file removing matching statements like this, and some other odd edge cases, like an item being lockered over the same item. What this did is gain us some big savings in file size, and a fair reduction in load times … but something still wasn’t right. After some more investigation, we realised that there was a graphical element that was being re-drawn every time the locker status changed, and that was eating up load time as well! That little hole was soon plugged, and now the graphical reset only happens if the game isn’t loading. One nice thing is that we now have the pre-processor in place, and we can add to it if we ever find another way to save space/load time. Hail, players! This week was another bug cycle (admittedly cleaning up most of the problems that were introduced by last week’s update). The good news is that we’ve also addressed some grey areas that previously weren’t favouring players, making them kinder and more accessible for players struggling in earlier parts of the game. Tutorials should be operating properly again, and struggling players will note our attempts to soften the blow of death and make light of their defeats in a positive and occasionally poetic manner. People tearing their hair out towards the end-game will also be relieved to hear that you may now pick exactly which trophy you take out of a dungeon run — but choose wisely, because it’s still just a one-monster allowance! This past week, we introduced the first draft of our new, graphical Kingdom. While fan reception seems to have been favourable (at least when compared to the tedious ol’ button system), there’s been a lot of concerns about readability, ease of use and overall practicality. We’ve got a lovely bit o’ news for you today: this is the first week that we’re taking the new Kingdom interface out of the back room and presenting it to players directly. Yup, the blog image isn’t a concept piece or a WIP, it’s a screenshot of what you’ll be seeing when you log in and start playing today. Now, this isn’t 100% complete in itself — not by a long shot — but after getting so much of the groundwork sorted, it’s really gratifying to post an update that’s at least mostly player-ready. Potential bugs and loopholes aside, we hope that players will have fun seeing our old, old, old vision for the Kingdom interface become a reality. There’s still a lot of work to do and a lot of half-completed elements: building interiors still need an overhaul, clarity issues and highlighting will need to be addressed (particularly with character selection) and there’s a bunch of other little tweaks and speech bubbles and pointers that need to be added as the graphical environment continues to evolve in the direction we want. In other areas of the game, there’s been a couple of supporting adjustments and additions, but nothing that’ll leave your brain splattered across the wall. We’re halfway through some progression changes for beginner and intermediate players, which are going to be closely tied in with the new levels of ease and fun that we hope the Kingdom will eventually attain. Cool stuff! One of the really interesting parts of running a rather long beta is watching players interact with each other and with developers over time. After a while, something seems to happen whenever a particular kind of problem is perceived in the game: Everyone tries to design their way out of the issue. That’s great, new ideas are never a bad thing, but often player input is tempered and mangled by what they perceive as the responses the developers are likely to take. That’s the Design Vocabulary that ends up informing the majority of conversation. Different games have different design vocabularies. 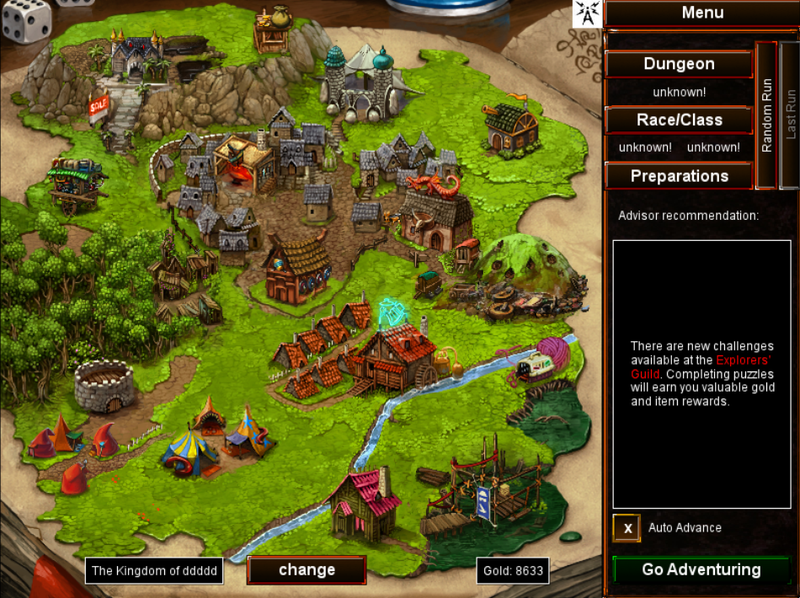 Desktop Dungeons has a vocab that focuses heavily on the idea of balance, player skill progression and dungeon completion. Players tend to talk about specific classes or gods being over- or under-powered in specific situations and motivate for the tweaking of numbers accordingly. Except oftentimes it’s not numbers that need to be tweaked and adhering to the design vocabulary that has so far governed the conversation is actually a bad thing! The classic example of this is the old saw of the players who complain that a certain gun in Random FPS Game is ineffective and useless, so they suggest new numbers for damage output, fire rate, etc. None of those values seem to make any difference and actually make the game less balanced as the gun cycles through being buffed and overused to nerfed and hated, until one of the designers simply changes the sound effect that plays when the gun fires and adds more bass. Suddenly everyone is happy with the gun at its original values and it turns out the balance was fine, everyone was just framing the discussion poorly due to a blind spot in the design vocabulary around the game. I raise this concept because there’s a big change coming in how we as a design team approach issues in Desktop Dungeons. It’s been brewing for a while now, but we’re finally at a point where we feel that tweaking numbers and effects is essentially navel-gazing in an already well-balanced game experience. The new definitions we’d like to see making their way into the vocabulary of the discussion revolve around strange-sounding terms like information-load and richness of feedback. Essentially, we’re focusing on making the game easier for people to pick up over time because it conveys better and more useful information to them as they play it. We know the game CAN be played, we just want to make that play experience smoother. There’s no end of situations in DD that can benefit from more information: Everything from players learning about bonus experience or wasting regeneration space to the effectiveness of poison on enemies and their current debuff state can (and should!) be displayed graphically. There’s been a lively thread on our forums about the in-game item locker functionality. The short version is that a core group of experienced veterans (players who have typically injected over 100 hours into DD so far) feel that they would like to be able to access every item in the game at a moment’s notice for their next run. Ideally, this would let them plan out strategies without having to go and find items in the game world. This is a specific sort of slippery slope problem that Aequitas wrote about quite a while ago, but it’s made worse by the fact that us humans are pretty damn bad at estimating the difficulty of a task once we’ve internalised the skills needed to be proficient at it. Take driving, for instance: Once you’ve learned to drive, you no longer actively think about the complex co-ordinated actions you’re using every second, instead you think in the broader terms of driving like changing lanes, slowing down, making that turn, etc. The same thing happens in game development all the time when a developer shows off their game for the first time and discovers that new players can’t even get past the first obstacle, which the dev has made harder and harder as their skills have grown through familiarity. 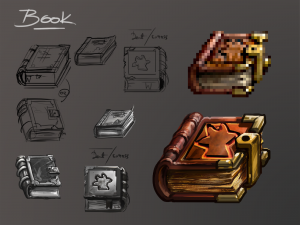 As it stands, we’ve changed how the Adventuring Locker works quite a few times now: We’ve added more storage space; We’ve made items lost or destroyed in dungeon runs easily replaceable; We’ve even added a temporary backpack for items that you carried out in your last run but don’t want to “waste” a locker slot on. The design vocabulary around the locker is one of space. Players always talk about space and wanting more of it. Except the actual complaint is that they have items in their locker that they don’t want to replace. We’ve approached this problem in a couple of ways, most notably by making most items require a single dungeon run to re-discover (granted, you have to win that run) and by allowing players to tailor random item drops by saying which items they never want to have appear. The problem is that players are never going to be happy with a limited locker space. Ever. It doesn’t matter that an infinite locker would essentially scare new players away with unnecessary complexity (compare DotA2’s hero selection to the limited roster of LoL, for instance) or that a “late-game” infinite locker wouldn’t solve the desire for more space either – it would just be wished for earlier and earlier. Hiding the “true” locker behind some incredibly difficult quest would end up not feeling fair… Seeing as this seems to be a situation that players are probably always going to be complaining about, no matter what particular phrases of the current design vocab we implement this week or the next, we have to make the hard choice to simply say no. No, the locker isn’t going to expand unless we see a way to prevent the same complaints from cropping up yet again once people have had a month to start taking the change for granted. Every single limitation or cost proposed for an infinite locker so far has this slippery slope weakness, so the only way to prevent sliding down it is to stand fast. We generally like keeping a certain theme around every beta update post, but this week’s fixes are scattered about like breadcrumbs over a kitchen counter. A randomly-generated, puzzle style kitchen counter. It’s difficult to say what the big news is this time around. So, we guess this post is here to announce that we made a whole bunch of little fixes this time around. Some of them are related to balance, some of them are related to crashes and one of them is an alleviation of loading times for older profiles (yay!). Other highlights include a Witch preparation nerf, increased returns on the Vicious token, a bug fix which rebuffs the burning / corrosion combo and an attempt to make maze-style generators slightly more friendly (while the Shifting Passages become slightly more sinister). 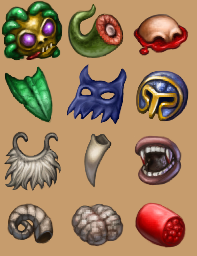 We’d been thinking about adding a Vicious Token into the game for a while now, a way for a player to choose to make every dungeons a real challenge. We knew our over-the-top tier players would eventually get bored with even the most vicious of dungeons. We also knew they would find everything leading up to those dungeons a breeze. So in our usual way, we made the Vicious Token absolutely ridiculous. 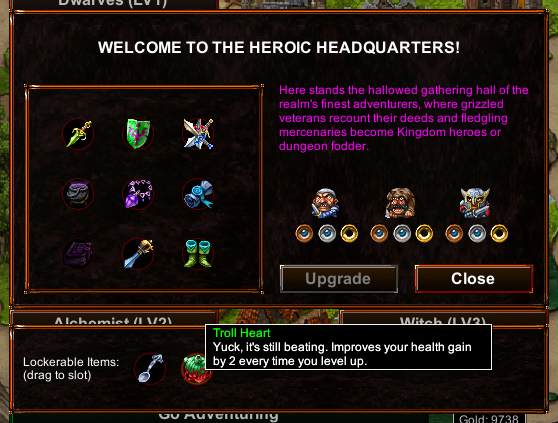 Every enemy in Desktop Dungeons has two ‘toughness’ ratings: one for health, and one for damage. In a normal dungeon, those are both set to 1. 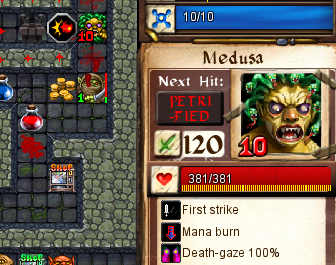 In a hard dungeon, it’s around 1.2. In a vicious dungeon, it’s more like 1.6. So for the Vicious Token … we set both to 2. Our logic here is: Set it high, and see if it’s doable. If it’s way too high, we can bring it down until it sticks, and if it only allows the spammiest of tactics, we can bring it down a little less. In the weekend after release, there was much wailing and wringing of hands. This means it was probably a little too hard … but people were still managing a fair number of wins. There was a very real slant towards BURNDAYRAZ strategies, which suggested that the enemy health was beatable, but the damage was not survivable. This week we’ve lowered the damage toughness for the vicious token, but left the health toughness the same. Hopefully this will let the vets stretch their “make every tactic work” muscles a little, while still giving them a real challenge. Oh, and we took the Vicious Badge requirement out of the Perpetual Questing Initiative pool … that was just mean. We have a treat for intermediate and expert players wanting a game-wide difficulty spike: the new Vicious Token is out and about and hidden within the Kingdom somewhere, allowing suitably experienced adventurers to sally forth and make their own lives much more difficult for some reason or another. Classes and certain game features have also been hit with the nerf bat again. In fact, the list of changes is reasonably chunky. This probably makes it the wrong time to introduce our massively more difficult game mode, but one can never underestimate the creativity and tenacity of the Desktop Dungeons player base. We’re sure the veterans will manage. Somehow.